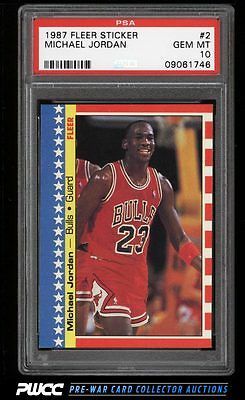 An absolutely amazing '87 Fleer Sticker Michael Jordan PSA 10 on the auction block this month. The offered '10' currently represents one of just twenty examples assessed as perfect by PSA in over 20 years of professional grading. A condition sensitive issue which boasts four exceedingly sharp corners, pristine edges and impeccable surfaces. Jordan is widely considered the greatest Basketball player ever and his cards continue to rise in value. Deserving of the best collection. One of nearly 20,000 cards, lots, and sets up for bid in our 7th Auction of 2016. Click on the link above to view the other PWCC auction lots.